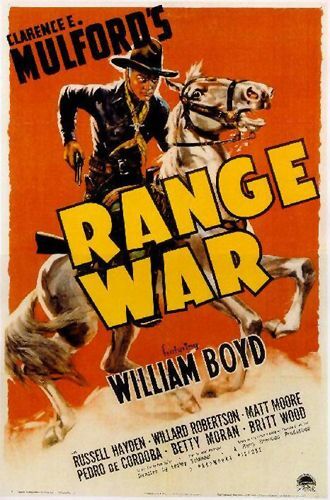 If the Frontier wasn’t filled with violence enough — stemming from Indian raids, numerous outlaws, and the ever-present vigilantes trying to control them, then another common event was the frequent feuds, range wars, and political conflicts that created yet more bloodshed in the Wild West. The violence created in these many battles often occurred where there was no law or the law was too “weak” to enforce any type of change. Similar to the vigilantes, those who felt they were unduly wronged, were prone to take the law into their own hands. Sometimes these feuds were the result of long-running arguments between two groups of people, especially families or clans, and perhaps may have started decades earlier over the smallest insult. One thing leads to another until cycles of retaliation can last for generations. However, the vast majority of the well-known feuds in the American West were the result of political confrontations or land control. 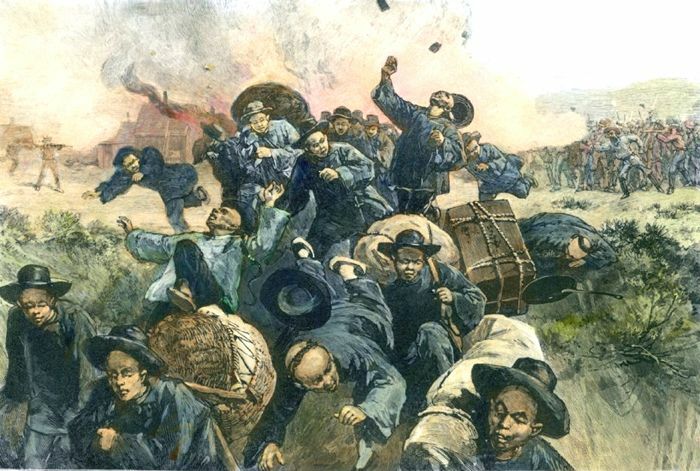 For those involved, their actions were rarely seen as lawless, but rather a means to bring some kind of “law” to an area where chaos tended to prevail. Regardless of the reasons, these “wars” resulted in hundreds of deaths, when vengeance was taken and bloody vendettas resulted in warring factions continuing to battle, sometimes for years. 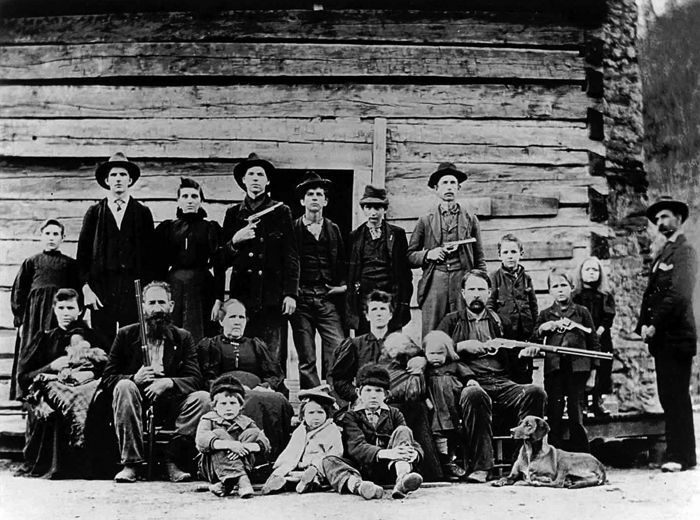 The Bloody Feud of the Hatfields and McCoys (1863-1891) – Having its roots in the Civil War, the feud between the Hatfield and McCoy families took place in the Appalachian Mountains along the West Virginia-Kentucky border area between 1863 and 1891. Brooks–McFarland Feud (1896-1902) – A family feud that took place in the Creek Nation of Indian Territory (Oklahoma) at the turn of the century. The conflict began with the death of Thomas Brooks on August 24, 1896, while he was attempting to rob a Texas Ranger. Colfax County War (1870-1877) – Guns roared for almost two decades after Lucien Maxwell sold the largest land grant in U.S. history, located in northeast New Mexico. Denver City Hall War (1894) – At this time the city of Denver, Colorado was so politically corrupt that Governor Davis Waite ordered several reappointments. However, city officials refused to vacate their positions and Waite called in the militia. Dodge City War (1883) – Though this “war” was bloodless, it was just inches away from an all-out gunfight when Dodge City, Kansas businessmen tried to push Luke Short out of town and he called on his buddies, Wyatt Earp and Bat Masterson. Early-Hasley Feud (1865-1869) – A family feud in Bell County, Texas that became more embittered after the Civil War. Earp Vendetta Ride (1882) – After the Gunfight at the O.K. Corral in October 1881, and Morgan Earp’s murder on March 18, 1882, Wyatt and Warren Earp, along with Doc Holliday, “Turkey Creek” Jack Johnson and Sherman McMasters would go on the Earp Vendetta Ride killing those responsible for Morgan’s death. El Paso Salt War (1877) – A feud that occurred over the salt flats of the Guadalupe Mountains that culminated in a bloody battle in the small town of San Elizario, Texas. Horrell-Higgins Feud (1877) – This family feud grew out of accusations of cattle theft in Lampasas County, Texas. Horrell War (1873-74) – After a friend of the hell-raising Horrell brothers killed a Hispanic constable in Lincoln County, New Mexico, lawmen killed Benjamin Horrell. The other brothers retaliated by killing some 13 Hispanic citizens during the course of the feud. 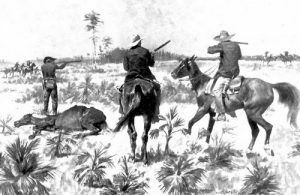 Jaybird-Woodpecker War (1888-1890) – A political war in Fort Bend County, Texas over control of the county. 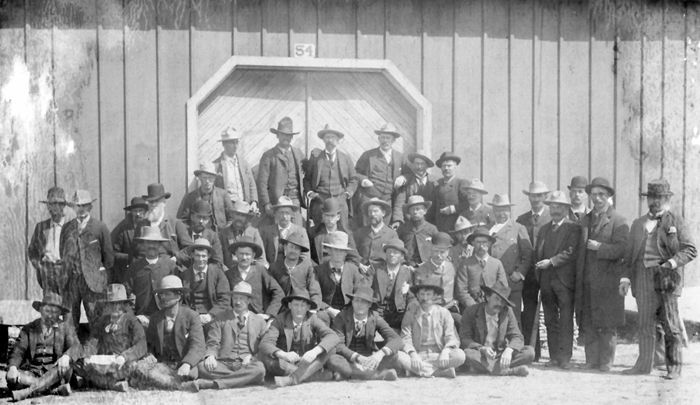 Wolcott’s Regulators of the Johnson County War in Wyoming. Johnson County War (1892)- Sometimes called the War on Powder River, this feud came to a head in 1892 as cattle barons and small ranchers battled it out for land and water rights in Wyoming. Kansas-Missouri Border War (1854-1865) – Beginning seven years prior to the Civil War, this bloody conflict was fought over whether Kansas would be a free state or a slave state and continued on throughout the Civil War. Lee-Peacock Feud (1867-1871) – One of the best known of all the feuds in Texas, the Lee-Peacock Feud in northeast Texas following the Civil War, this was not simply a dispute between families, but a continuation of the Civil War, lasting four bloody years after the rest of the nation had laid down their arms. Lincoln County War (1876-1878) – A war between two rival factions attempting to control the economics of Lincoln County, New Mexico. Mason County War, aka: Hoodoo War (1874-1876) – A battle between rival German immigrants and native Texans which occurred when large numbers of cattle began to be killed or go missing. 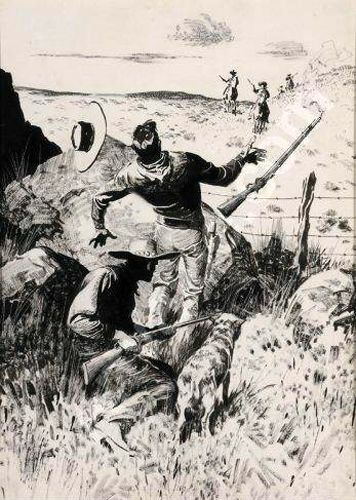 Pleasant Valley War, aka: Tonto Range War (1886-1892) – Range war between the cattle-herding Grahams and the sheep-herding Tewksburys in the Pleasant Valley of Arizona. Riot in Rock Springs Leads to Massacre – (1885) – White miners strike against the Union Pacific Coal Company in Rock Springs, Wyoming due to use of Chinese Laborers, which turns into a Massacre. 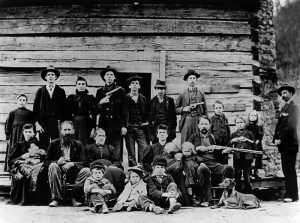 Slicker War of Benton County, Missouri (1840-1842) – In the old-fashioned tradition of a Hatfield and McCoy type feud, was the “Slicker War” of Benton and Polk Counties of Missouri in the 1840s. The Stevens County War (1888) – Two small towns in southwest Kansas fought a bloody war over the county seat, leaving in its wake a number of corpses. Sutton-Taylor Feud (1868-1875) – This family feud, that grew out of the bad times following the Civil War, occurred in DeWitt County, Texas and was one of the longest and bloodiest in the state. Texas Regulator-Moderator War (1839-1844) – The first major feud to break out in Texas was born during Texas’ days as a republic. For years, a strip of land in East Texas that bordered Louisiana and Mexico had been ignored by Spanish, Mexican and Texas authorities. By the time Texas became a republic, the swatch of land had developed into a lawless place where land frauds, cattle rustlers, and killings were common. Tutt-Everett War (1844-1850) – A political dispute in Marion County, Arkansas that escalated to violence over the years. Compiled by Kathy Weiser-Alexander, updated December 2018.